You should never bring a new pet home without first learning everything you can about the specific animal you are purchasing. A color-changing pet chameleon has the potential to provide years of companionship. The particular species of chameleon and the quality of care you provide him will determine exactly how many years he lives. As a species, chameleons will generally live 2 to 3 years in the wild. Chameleons who live in captivity generally live longer than those who live in the wild. The life span of a captive chameleon can range between 3 and 10 years. Gender will influence the length of time your chameleon lives. Male chameleons tend to live longer than females. For example, male veiled chameleons live an average of 8 years in captivity. Female veiled chameleons only live an average of 5 years. 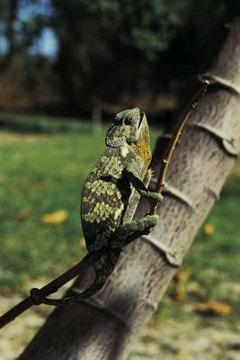 More than 100 chameleon species exist in the wild, but only a handful of these are regularly bred and sold in captivity as household pets. Among these, life spans vary. Panther chameleons can live 7 to 8 years; some individuals live even longer with proper care. Veiled chameleons live 5 to 8 years. A healthy chameleon needs a varied diet with plenty of fresh vegetation and insects to eat. Supplements are beneficial to captive chameleons but cannot replace a healthy, balanced diet. Chameleons also need plenty of fresh water, ample space in their living enclosure and a safe, predator-free environment to live in. Chameleons who are not living in good conditions will die earlier than those who receive regular veterinary care and live in ideal conditions.